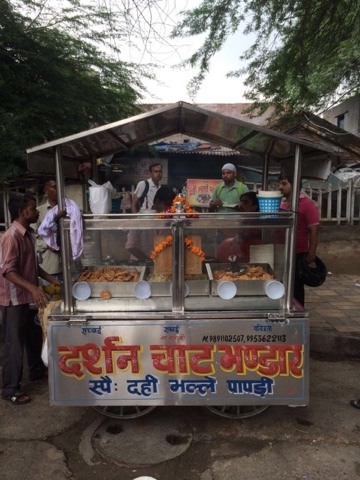 If you live in North East Delhi , chances are you might be aware of this little shop on a cart selling mouth watering Dahi Bhalla papdi ( a sweet,tangy and spicy indian snack made with fried lentil balls dipped in yogurt and served with green chutney and sauces with some crunchy fried wafers thrown in ). 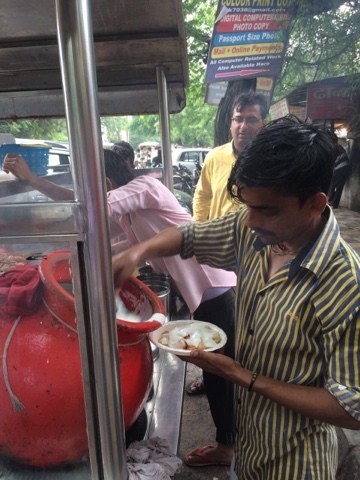 Location - Since it is a Thela (push cart) there is no permanent address ,but it is located near Rajpur Transport Authority ,on Rajpur road ,near 5/9 under Hill Road ,Delhi 110054 .This is an area close to Civil lines ,Delhi . Price - Rs 60 per plate , they even pack it for you at an extra charge of Rs 10/- .I must say I was also very impressed with the neat and hygienic packing at par with Halidram's and Bikaner sweets . The portions are generous and a plate is a mini meal . 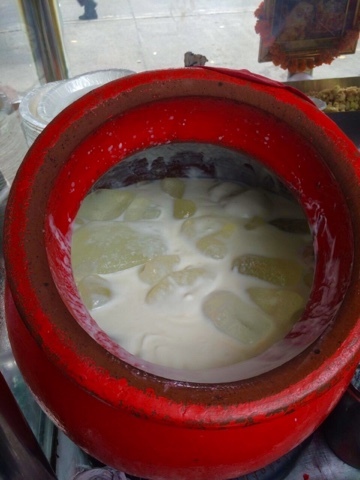 Ice in the curd not only helps to keep the curd chilled and give respite to the palate but also keeps the the curd from turning sour . 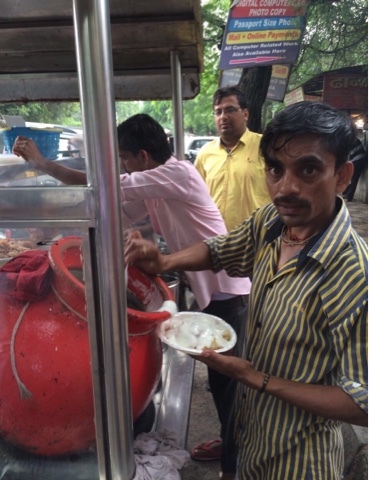 This joint has been operating for many years and the person handling it is very dextrous at producing the chaat with in a minute .Though a roadside joint ,the vendor takes care to keep it as hygienic as possible in such surroundings . This is the end product of the quick tossing , turning and churning by the vendor .Juicy,soft bhallas and crunchy papdis in sweet and sour curd with sweet khajoor(dates) chutney and spicy green mint chutneys, garnished with sliced ginger and pomegranate seeds . 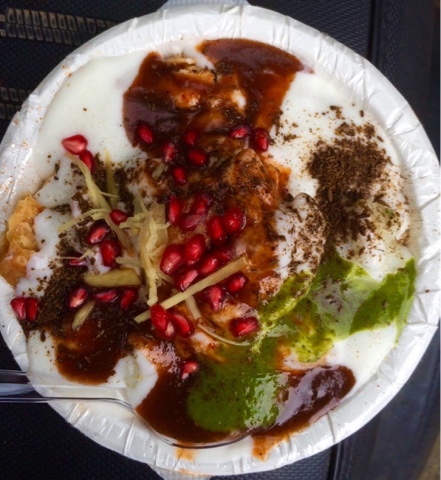 I am sure you will come back for seconds if you love Dahi bhallas . FINAL VERDICT - I rate it a 4/5 .No minus marks for the taste , minus marks only for it being a roadside mobile joint with no air conditioning and seating .If you can brave the weather and the waiting , you will love this stuff . Now I get from where that lip smacking papri chaat came! 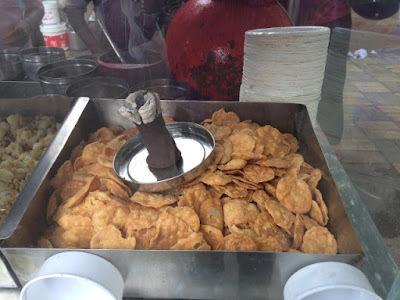 We have somebody similar in Ambala, a small stall/shop and people flock to his place. You must share the details,Alok !